The windshield was iced over, global warming notwithstanding. 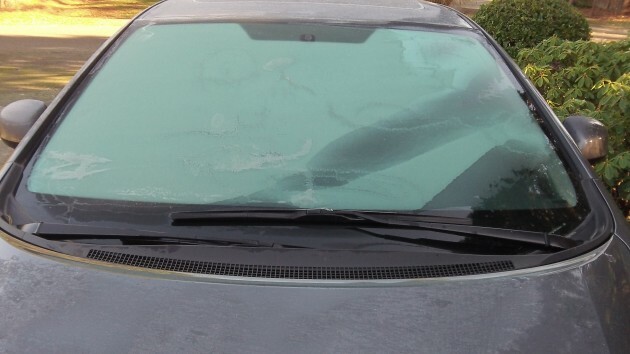 They didn’t invite me to the big climate-change summit in Paris, which is just as well because I’m stuck here with an iced-over windshield. I could run the engine long enough to get warm and let the defroster take care of this, but then I’d be adding a load of carbon dioxide to the atmosphere without going anywhere at all. So in Paris they are bent on shutting down our least expensive and most plentiful form of fossil energy, coal, and cutting back on oil and gas as well. On the one hand, the political class bemoans the increasing gulf between the rich and the rest of us, and in the next breath they make sure the gulf gets deeper and lasts forever. It probably won’t be long before policies advocated by the environmental elite will reduce most of us to living in conditions like those of a century ago. No more energy-using luxuries or conveniences except for people making millions. Most other people won’t be able to afford electricity or fuel or natural gas. If you want heat, gather wood and find yourself an old stove. Want to go to town for supplies? Take the bus if you can’t afford a horse. Why do they want to suffocate plants? I recall pictures of large metropolitan areas in China with massive numbers of bicyclists. Yet, even with that huge amount of folks riding them, the pollution there is very scary. I also seem to recall that when they literally shut down motorized traffic for a short bit in advance of the Olympics, their skies cleared very dramatically. How do we reach a happy medium? Migrate to electric powered transportation, where the carbon emissions at the power plant are better mitigated than the tailpipe. Central power plant efficiency is pretty puny — under 40%. Internal combustion engines tend to be higher. Including the transmission losses, electric still loses unless the source is something other than thermal. So what was happening 100 years ago in 1915 versus now? Typhoid Mary was infecting folks in New Your. Now, ebola is infecting folks in Africa. Babe Ruth hit his first home run. The Timbers may get their first title next Sunday. The US occupied Haiti which would last for 22 years. Now folks want us to occupy a chunk of Syria/Iraq…again. The Second Klu Klux Klan was founded in Stone Mountain, Georgia. We have Donald Trump. A lot of things are not so different. On the other hand a lot more folks lived in rural areas that were not yet electrified and they used a lot less energy in their daily lives. We also have been cutting our energy usage. Cars get vastly more miles per gallon than they got 60 years ago. We now generate an increasing amount of electricity from wind and other renewable sources. It is a wild and unproven assumption that reducing carbon emissions is going to somehow move our lifestyles backward. It certainly hasn’t happened yet and I doubt that it will. Humans are, without question, the most adaptable species that has existed, because we are the first that has learned to directly manipulate our environment. Dealing with the effects of climate change, that we clearly have a hand in, is just another pressure that we can and will adapt to. Adaptation requires change. The willingness to change has always been a great barrier for a large number of people on a large range of issues. However, that resistance to change will not stop its inevitability of occurring. Bob, the assumptions that are so wild and unproven include that man is the primary cause of the Global warming that hasn’t happened in the last 15 years…. People who pick and choose the science they choose to believe are ignorant, case closed. They are people who seek to reinforce their already adopted belief system regardless of facts that contradict their beliefs. Science is never perfect and never claims to be. Science is, however, the cumulative and agreed upon framework that best explains nature and the reality of all existence that surrounds us. As data changes, science adjusts with new theories and systems explanations. Science is never static. Our cultural framework freely allows you to disagree, regardless of the fact that only a small fraction of people agree with you. Nevertheless, the issue of global climate change is a serious concern shared by the overwhelming majority of scientists and lay people across the world. That is as true as when groceries cost more, when drugs cost more, when housing costs more, etc. Yet the fundamental tenets of a growing economic system means that everything costs more over time. It’s simple inflation. And you do not have economic growth unless inflation exists in every economic system. You use costs as a crutch to refute science. That is intellectually unsupportable. Science seeks to measure what is. It seeks to explain how the physical universe works. Science doesn’t care if the cost of your nacho’s goes up by 25 cents. Whether you’re talking about how to increase crop yields, or the effects of ocean current changes and temperatures on fish stocks, or whether electromagnetic waves in a resonant cavity can create thrust without a propellant, science seeks nothing more than to explain what is or what may be. To date, the overwhelming majority of scientist see the systematic effects that climate change presents to the world. Measurements of the increases in atmospheric carbon dioxide and other greenhouse gasses over the last 130 years has not been refuted by anyone. Accelerating increases in polar temperatures, shrinking glaciers, and rising sea levels are observed world wide. It’s not that they have not occurred before in the history of the planet, they have. The earths position relative to the sun, cometary impacts, and strong changes in volcanic activity have occurred many times over the last 4 billion years. The fact that these “natural” changes have occurred in the past does not negate the effects of the worlds first rapidly expanding technological civilization, highly dependent on the use of energy in all forms including fossil fuels. In 1750, shorty before this nation was founded, world population was estimated at 760 million people. 50 years later in 1800 it reached 1 billion. By 1950, 150 years later and two years before my birth, it had reached 2.5 billion. 55 years later in 2005 it was 6.5 billion. Now in 2015 it is at 7.3 billion. How can anyone fail to understand that 7.3 billion people, ever advancing across the globe into modern technological societies, not only pump greenhouse gasses into the atmosphere but that they also generate huge numbers of BTU’s of heat from power plants; air conditioners; automobiles; home heating systems; radiated body heat; industrial farming; heated/cooled swimming pools; asphalt parking lots (and on and on) which contributes to additional warming of the planet beyond “natural” systems. Science does not care weather your are Republican, Democrat or a billionaire. But the 1/3 of the people in this country who decry climate change, like you, all appear to be the most highly politicized conservative and/or evangelical Republicans. That may be the most telling data point of all. For you it’s politics, not science. Global, regional & local climate is continuously changing and (so far as I’ve read) always has. Global warming is a different issue. Warming has been occurring since the last ice age. The assertion that warming is all bad (or all good for that matter) is specious at best. Rising energy prices, in concert with supply and demand, is what causes the cost of everything else (produced products, such as groceries) to rise. Yes, but what has been refuted is a cause-and-effect relationship. Well, of course. How could natural occurrences negate (make ineffective) a civilization? These are disjointed statements. “How can anyone fail to understand that 7.3 billion people, ever advancing across the globe into modern technological societies, not only pump greenhouse gasses into the atmosphere but that they also generate huge numbers of BTU’s of heat from power plants; air conditioners; automobiles; home heating systems; radiated body heat; industrial farming; heated/cooled swimming pools; asphalt parking lots (and on and on) which contributes to additional warming of the planet beyond “natural” systems. People don’t generate BTUs of heat from power plants. First, BTUs are units of energy, not heat. Second, people don’t generate the energy, they (we) use devices that transform the energy that is generated by the power plants.Asphalt parking lots, by the way, do not contribute to global warming, they simply alternately absorb energy and radiate energy. Everything you name is simply an energy converter, changing one form of energy to another. And yes, entropy exists. There is no getting around that. And what about the other 2/3rds? Are they the most highly politicized liberal and/or anti-christian democrats? “The British thermal unit (BTU or Btu) is a traditional unit of work equal to about 1055 joules. It is the amount of work needed to raise the temperature of one pound of water by one degree Fahrenheit (Physical analogue: one four-inch wooden kitchen match consumed completely generates approximately 1 BTU). In science, the joule, the SI unit of energy, has largely replaced the BTU. Half of Republicans support further government action – my 1/3 was too high, it’s really only the other half of all the Republicans, and the last Gallup survey from 2014 found that 25% of folks in the US identified as Republican, 31% as Democrat and 42% as Independent. A separate regression analysis published in the Washington post showed that those people most strongly denying human involvement in climate change showed that those people self-identified as conservative republicans and evangelical Christians. The rest of the people in the country whether moderate, liberal, independent, republican, democrat or religion of your choice, are part of the large two-thirds majority as reported by the CBS/Times survey cited above.